Canon – Where’s my EOS 7D Mark III? 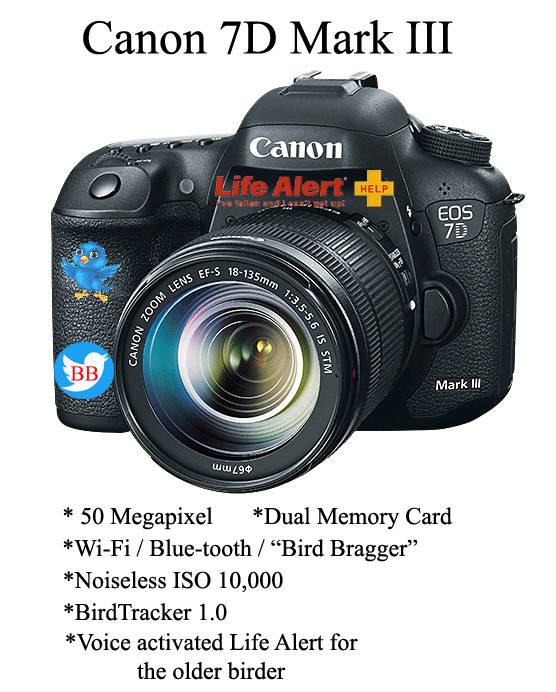 Without sparse information about any potential release of a Canon 7D Mark III, I’ve put together a mock prototype of the features I’d like to see as an aging birding photographer, including 1) Noiseless ISO 10,000 to ensure adequate bird-capturing shutter speed, 2) WiFi/Bluetooth with built in “Bird Bragger” button enabling instant sharing of your photos with your social media birding friends, 3) BirdTracker 1.0 software, enabling automatic locator and tracker of your subject in the viewfinder, and 4) Voice-activated Life Alert for emergencies. With a long Australian vacation looming this summer, I’ve upped my photography game by buying the Canon EF 100-400mm f/4.5-5.6 IS II lens. I’m shelving (and possibly even selling) the 400mm 5.6L I’ve used almost exclusively for the past 15+ years, as I want that flexibility of the zoom, and I absolutely need that IS as I get older. I’ve been busy at work, including a week at a conference out East, and I haven’t had much of a chance to take the new lens out for a spin. After traveling through today (Sunday), I am taking off tomorrow and hope to put the new lens to good use. However, as with any photo geek, immediately after one big purchase your mind moves to…the next big purchase! Given how long I stuck with my 400mm, my recent lens purchase isn’t exactly a sign that I make decisions to change equipment lightly. But my primary camera body is a Canon 70D that’s now about 6 years old. It’s “big brother”, the Canon 7D Mark II, came out about 6 months later, while the successor in the XXD line, the 80D, came out at the start of 2016. I’ve been skipping a generation or two as Canon comes out with new XXDs, starting with a 20D, then 50D, then 70D. I’m at a stage where I’m ready for an update. The Canon 70D/80D and the 7D Mark II are showing their age compared to other offerings that have come out the last couple of years. But alas, Canon has given no clear indication as to when the next mid- to pro-level APS-C body is going to come out. Rumors about an upcoming Canon 90D or 7D Mark III have been floating around for at least two years, with prognosticators last year predicting a new 7D Mark III announcement in mid-2018, announcements related to one or both anticipated camera bodies in late 2018, then additional projections of early 2019. With several of the big shows coming and going in 2018 and early 2019 with nary a word from Canon about either camera body, rumors now suggest Canon is purposely focusing on their mirrorless full-frame bodies and has likely scrapped one of the DSLR APS-C body lines. The XXD and 7D lines may now be merged into one APS-C line in the future. But it’s anybody’s guess when that next body is announced. While we wait, Canon is definitely trying to push people to mirrorless. Mirrorless may or may not be the wave of the future. But hey, I don’t care about the future. I care about the best camera available now, for the style of shooting I do. Mirrorless is generally acknowledged as advantageous for size. Some people point to the electronic viewfinder as an advantage. They point to the silence, and potentially faster burst rate (no mirror to recycle position between every shot). But you know what I care about? Being able to take a sharp photo of a bird. Pretty simple! But how does one do that? When I started 20 years ago, you realize the major problem is getting close enough to your quarry so that your equipment enables the bird to fill a significant part of the frame. Obviously the more reach your equipment has, the more of a chance you have. The problem…I simply can’t afford the Canon 500mm or 600mm lenses that are favored by most (Canon) bird photographers. They’re around $9,000 and $12,500, respectively. Thus, when I made the decision to go all-in with Canon DSLR 15 years ago, I bought a “cheap” Canon 400mm 5.6L at around $1,100, a lens that was used almost exclusively for my bird photography until the recent 100-400mm purchase. I also have used APS-C sized sensors on my camera bodies every since I bought my first Rebel 15 years ago (to my 70D I use today). Cost was part of the equation in going with APS-C, but frankly the over-riding reason for staying with APS-C over the years is that 1.6x crop factor. I’m ALWAYS searching for more length. With that 400mm 5.6L and a 20D, 50D, or 70D, I can’t use a tele-extender and maintain auto-focus, but that 1.6x crop factor is SO welcome. It’s a poor man’s way to turn that 400mm lens into what seems like a 640mm lens. With the lenses that I can afford, I can’t imagine the countless photo opportunities that would have been missed over the years without the extra length the crop factor effectively provides. So Canon…yeah…I get it. I think you’d like us ALL to move to mirrorless. But can your mirrorless bodies do a great job tracking a moving bird in flight? Does it provide a live view through an optical viewfinder without any lag (again, pretty damned important for a moving target)? Can I get one of your mirrorless options in an APS-C sized sensor that effectively gives me a bit of a boost for my main birding lens? And importantly, do you have something at a cost that is something I can afford? I don’t have that option in mirrorless right now. And until Canon provides a 90D or a 7D Mark III, I don’t have a new option in DSLR right now either. Was hoping against hope that the new body would be announced before our Australia vacation, but I don’t see any sign of that announcement coming anytime soon. I just wish Canon would realize there’s still a market out there for non-millionaire wildlife shooters like myself. I wish they’d provide some indication as to when that 7D Mark III is going to come out.